Sarah Moore was one of the best known people in Addiewell - a pioneer of the Labour party, and one of the early women county councillors. She was deeply concerned with social justice and the rights of working people. She was the leader of the famous protest at West Calder Parish Council Office in 1926. The Parish Council had decreed that striking miners were not entitled to any form of benefits to keep them from hardship. 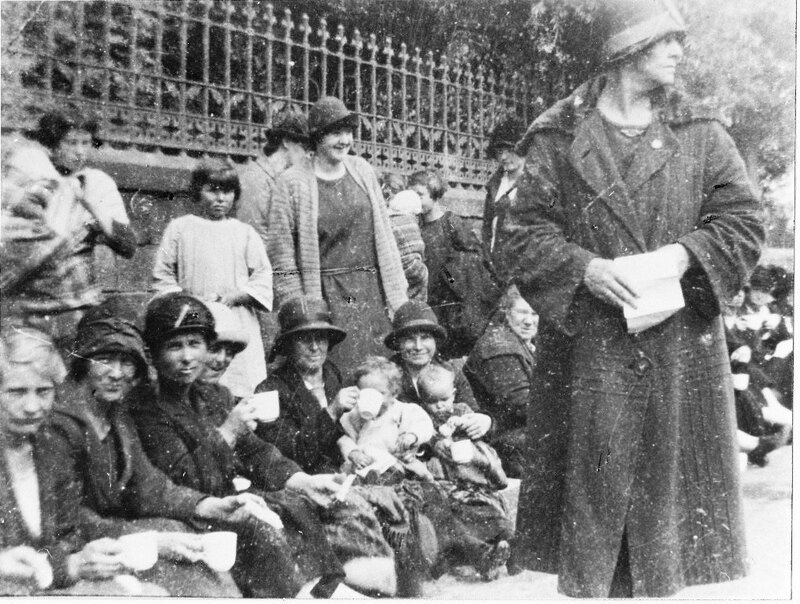 A group of miners' wives from Addiewell gathered outside the office in West Calder to demand benefits for their striking husbands. Most were carrying young children, but the protest was roughly broken up by a police baton charge. In 1929 she was elected the councillor for Addiewell and Loganlea on Midlothian County Council and served for 27 years. She was a prominent member of various committees and boards, and particularly concerned to improve public health and welfare. She was a formidable opponent, but was highly popular and respected in the area, being returned unopposed at practically every election. She was affectionately known as 'Ma' Moore'. Her husband was active in the Co-operative movement, and together they had a family of six daughters and three sons. Several of their children were also active in politics. 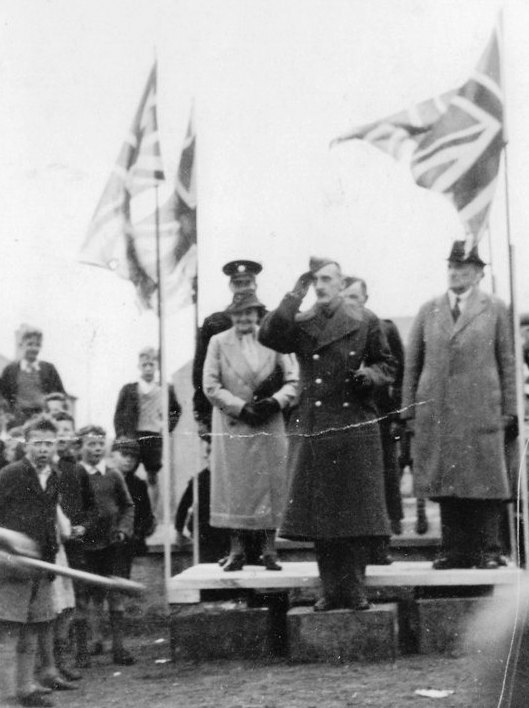 One daughter, Rose, succeeded her mother on Midlothian County Council, and another, Mary (Mrs Rogers), was chairman of the Blackburn branch of the Labour Party for many years, and was a great fighter for Labour and the Co-operative movement. At the foot of the page you can read obituaries that appeared in two local newspapers. John Kelly. All rights reserved. S1. 95. 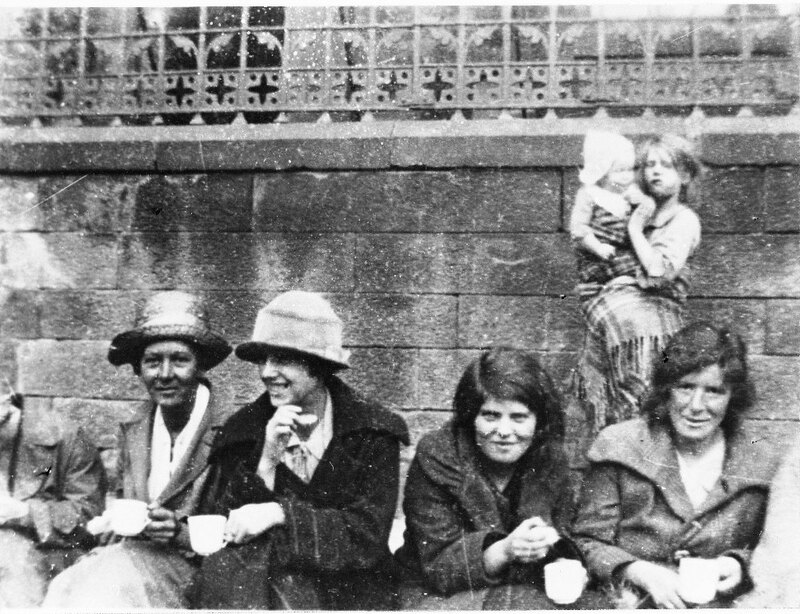 Some of the women and young girls involved in the protest. Among the other owmen involved were Mrs Murphy, Mrs Green, Mary Kane, Maggie Finnegan and Theresa Bradley. John Kelly. All rights reserved. S1. 96. 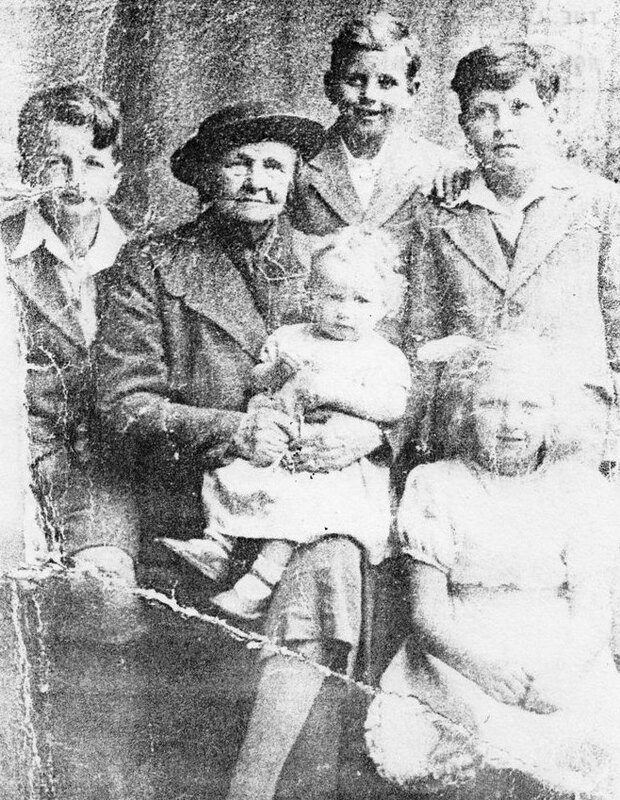 Ma Moore with some of her grandchildren. John Kelly. All rights reserved. S1. 161A. Ma Moore takes the salute at a wartime or victory parade. John Kell. All rights reserved. S1. 241. Some of Ma Moore's grandchildren, c.1936. 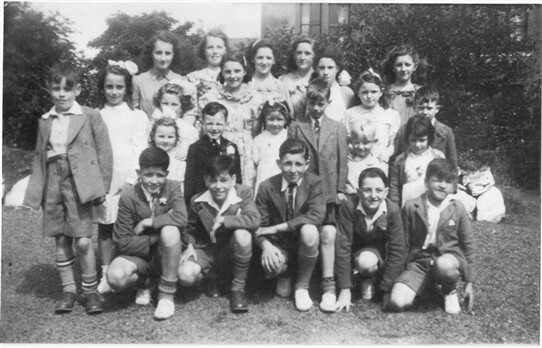 (L-R): Sadie Moore, Sadie Irvine (Mrs Prinzel), Cissie Kelly, Henry McMeechan, Alex Kelly, Lawrence Irving, Jim Irving. John Kelly. All rights reserved. S1. 238. Despite her family commitments and public life, Mrs Moore also found time to write poems and verse. This obituary appeared in the West Lothian Courier of 19 September 1947. Very proud to know this woman was my great grandmother. My aunts Judy (Rose) was also a great woman who is dearly missed. 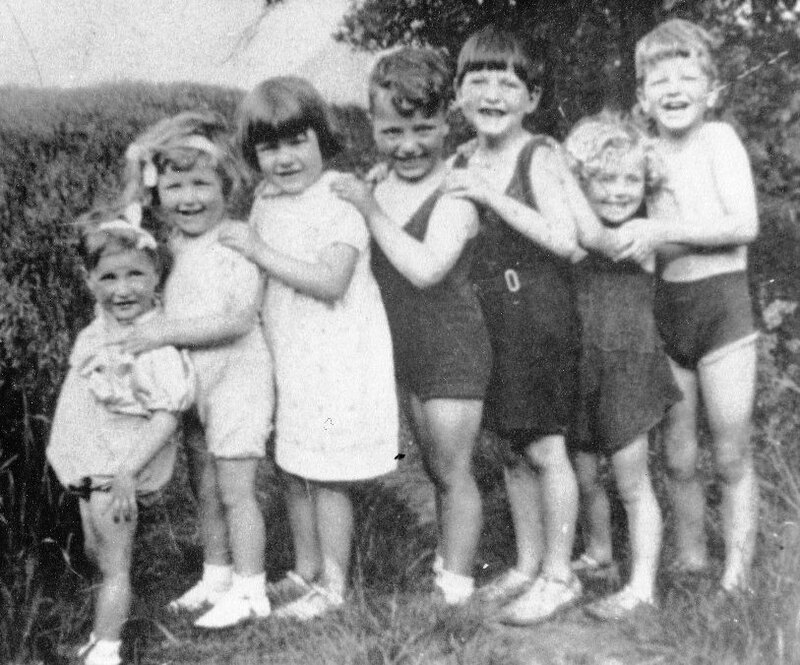 I was 6 when Ma Moore died, unknown to me, but I to was involved with the labour party for fifty years, I raised £305,000 and built a Childrens Play Park in my area in Airdrie. Very proud to be the great great-granddaughter of this amazing woman. Ma Moore was my great grandmother, My grandmother was Leanora Moore (Kelly) ,my mum was Jane (Jean) Kelly (Barclay) My mum told me her grandmother was a councillor and the street they lived in moorlands was named after her , I never knew there was so much more to this great lady. I feel so proud to be related to her. Re my comments 21.05 I meant to add I have no problem with anyone related to Ma Moore knowing my e mail address. Well I seem to be the odd one out here as I'm not related at all. Unless poetry relates us. Beautiful, wonderful woman. I just heard about Sarah Moore on the BBC4 programme Scotland's First Oil Rush. What an inspirational woman, her family commenting on these pages are rightly proud. Is any of her poetry available online? Hi Essi, I haven't been able to find any online versions of Ma Moore's poems, but perhaps a hardcopy (if there are any) will be published on the internet in the future. They would be really interesting to read! Ma Moore was my great great grandmother. An insperational woman who's poems are fantastic. I could possibly post some of her Poems online as my granda Irvine has a book of all her Poems.